Mike Collins and Laura Schuler were gazing in wonder at the walls of ShockBoxx. Mike Collins and Laura Schuler were gazing in wonder at the walls of ShockBoxx, the new art gallery they are opening on Cypress Avenue. 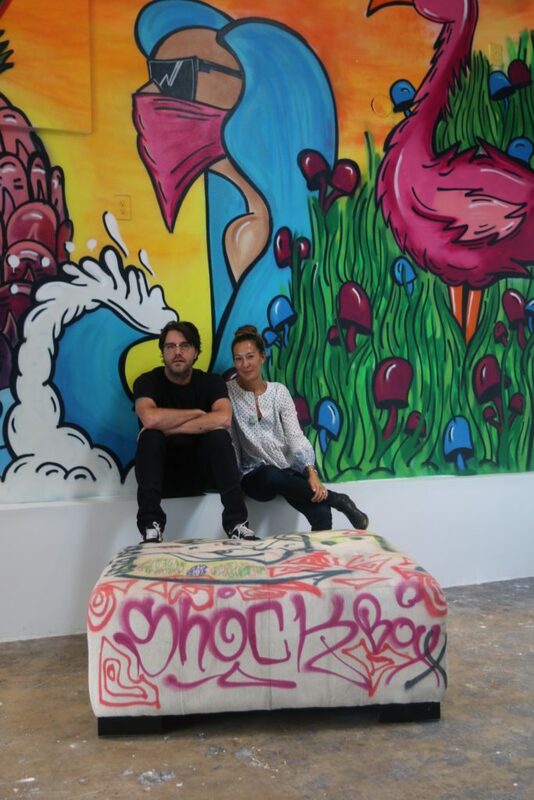 The first official show takes place this weekend, but a sort of soft opening happened last month, when they invited fellow Hermosa Beach artists LG Givot and Josh Barnes to inaugurate the place by covering the walls. The two grabbed their cans and went to work, taking to the walls with vibrant colors and some 25 hours of aerosol-propelled intensity. Now, Collins and Schuler had to think about how to cover it up. The walls at ShockBoxx will be a traditional gallery white, but Collins and Schuler aren’t promising a traditional gallery. They envision something that captures the zeitgeist of the Southern California art scene, preserving what is special about Hermosa while exposing locals to art they might otherwise have to get on a freeway to see. Asked about galleries that inspired them, Collins and Shuler excitedly toss out names like London’s Dot Project and the Corey Helford Gallery in downtown Los Angeles’ Arts District. What unites them, they said, is an artist-centric, artist-run ethos, one with a feeling distinct from a gallery run by mere collectors. “It’s a little more real. And I often feel like there’s more flexibility,” Schuler said. Surrounded by surfboard shapers, glass blowers and cabinet makers, ShockBoxx’s location has a special resonance.The area is the heart of the city’s historic surfboard manufacturing industry, and is among the few stretches of the city that are zoned for light-industrial activity. “Long before I ever got here, Hermosa was a place for artists: creative people, surfboard shapers, jazz musicians, photographers. We’re following in the footsteps of what was here before,” Collins said. It also gestures at the broader Southern California art scene. Collins mentions the Cool School, the founding brothers of contemporary art in Los Angeles who showed at the Ferus Gallery, as inspiration. The first show this weekend will feature art from Collins and Schuler. The title, “Break the System,” is intended to warn people familiar with their art to expect something completely different. Both artists have been showing in local art events for years, but promise new things for the show. “I’ve been working on my own style for a while I just wanted to do my thing, and give Hermosa Beach something that they haven’t seen showcased before,” Givot said. Collins set up a video camera, and played a timelapse of the process for guests on the first weekend. All of the dozens of cans of spray paint involved stood on the edge of a wall demarcating the gallery’s back room. Surveying the walls last week, Collins said it was almost a shame that the work of Barnes and Givot had to be covered up. “I’ll get back to you on how many coats of primer this takes,” Collins said.